Ocean Coast Electric is one of the leading full-service commercial electrical contractors servicing the New Jersey market. We are committed to providing our clients with excellent customer service and dependable electrical contracting work. With our highly skilled and dedicated electricians, engineers, project managers, and senior management, we are able to deliver innovative and cost-effective solutions regardless of the size and complexity of your project. Our capabilities range from million square foot industrial warehouses, pharmaceutical manufacturing facilities, and large office lighting retrofits, to small electrical jobs. Ocean Coast Electric is committed to building long-lasting relationships and maximizing value for our customers. Our focus on quality workmanship, communication, coordination, on-time performance, and attention to detail is critical for the success of all the different projects we work on. We are proactive, dedicated and resourceful partners to our clients and strive for an impeccable reputation in the commercial and industrial electrical markets. Our core values are integrity, teamwork, and excellence. We apply best in class management practices and maintain a strong financial profile to ensure reliable long-term sustainable growth. Ocean Coast Electric is your trusted partner in New Jersey. 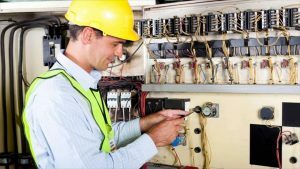 If you are looking for a commercial electrician company that is able to design, construct and repair countless electrical systems throughout Burlington, Union, Somerset and Mercer County, Ocean Coast Electric is the company you can count on. Our team is capable of building and designing new industrial warehouse facilities, providing generator installations for backup in case of a power outage, light installation for parking lots, setting up electric signs and much more. Industrial electrical services from Ocean Coast Electric also include repairs, replacements, and upgrades to the light fixtures of your building. We always make sure our customers are safe and secure which is why we install surge protection and emergency lighting across Middlesex, Union and Mercer Counties, as well as the surrounding areas. Plus, the experienced electricians from our company are able to establish server farms and create fundamental security measures to ensure all facets of a building are secure. When you are searching for a reliable warehouse electrician, know that Ocean Coast Electric has the best commercial construction contractors and electricians available. In addition to the regular service we provide throughout Somerset, Middlesex, and nearby NJ communities, we also offer 24/7 energy commercial lighting replacement services. We do this to give our valued customers the extra peace of mind they deserve when there is a power outage, or major electrical damage has taken place. If you need commercial electrical installation, contact us today by calling (732) 338-8732!